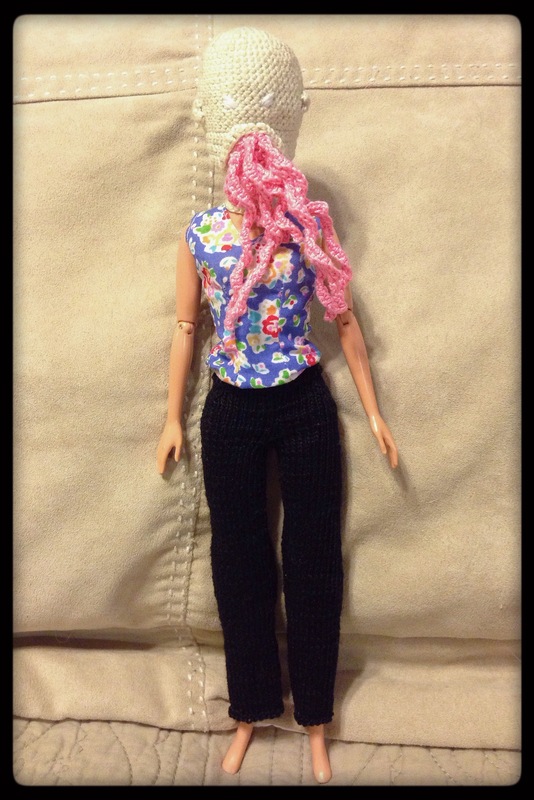 Ood Pants, Take 3 | Barbie Who? Finally! Something Ood! This is long over-due, but I finally bit the bullet and got pictures taken of the Ood pants. I know they don’t look great because the lighting here leaves much to be desired, but I’m going to go with it for now. For the next few weeks we will just have to make due with what I have available (the joy of moving!). So, on to the pants! Where to begin with these…. It feels like I’ve been working on them for ages. Looking back at the blog, that seems painfully accurate. I remember that when I first started them, just as an experiment, I tried to make this pattern in the round with my set of metal double pointed needles (DPNs). While this technique can work with larger sized yarn, it doesn’t work well with crochet thread. The problem I ran into was that the slack between DPNs didn’t get absorbed back into the surrounding stitches as I was knitting. This caused large holes in the sides, which was not aesthetically pleasing. I suppose I will reserve that technique for larger gauge yarns and stick with the regular way of making doll pants. Because that experiment didn’t go well, I made these pants with regular single pointed needles and sewed it together at the end. I found that slipping a stitch at the end makes the edges much easier to work with. I made sure to note that in the pattern, too. Once I got started with my regular needles, I ran into a few other problems. I finished the first leg, I set it aside, and my daughter found it. As any toddler would, she started waving the needle in the air and pulling at the string, so it was pulled entirely apart by the time I got home. This happened while her father was in charge, but it was ultimately my fault for not putting them somewhere toddler-proof. I had to start it over again after that setback because of how unevenly it had unraveled. Luckily, I didn’t have any other toddler-related incidents after that. I did have a bit of trouble when we were packing and moving, though. At one point, my work was misplaced and I feared it was in a box destined for the moving truck. Luckily, it surfaced before anything happened, but it was frustrating not having it to work on for those days. These pants used up almost all of the black thread on its skein. 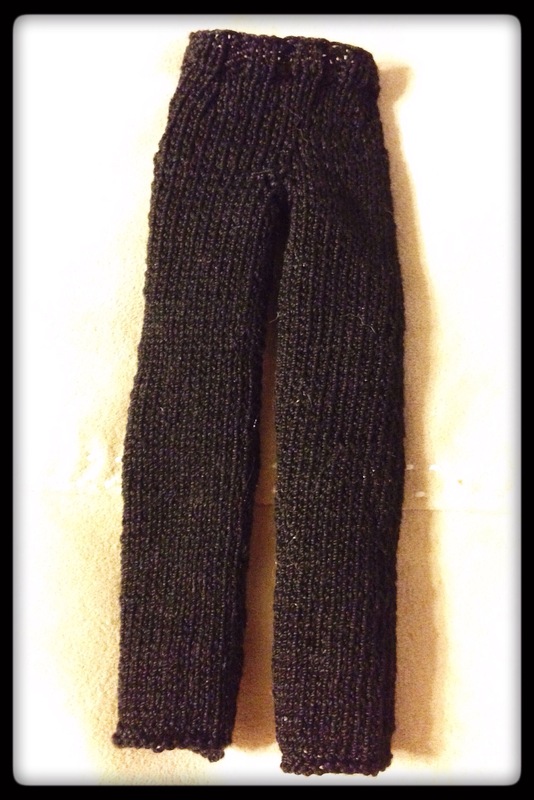 I have a few yards left on it when I was finished, but I was worried about running out as I knit the second leg. Luckily, skeins of crochet thread have a deceivingly large amount of thread on them even when they look barren. On that same note, something cool happened just after I finished this garment. I was at a thrift store with my mom and she I found a skein of black yarn! Same gauge that I use for my doll clothes and only cost $1. Forget lottery tickets, my luck guides me to cool thrift store finds. It may be a little thing, but I’ll take it. I created the pattern for these pants. I didn’t like the look of various patterns I found online because they were too form fitting, so I had to make the pattern myself to fit the Ood aesthetic. I went for a straight-leg pant that went down to the doll’s ankle. My first draft needed some tweaks, and the adjustments resulted in exactly what I wanted. 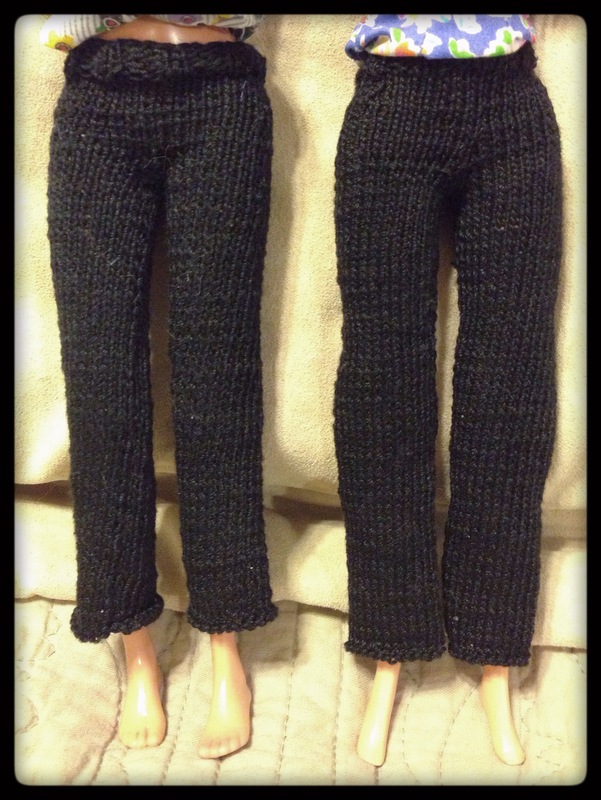 The biggest changes I did was lengthening the legs and adjusting the rows around the waist. In this picture, the first draft is on the left and the finished product is on the right. Here is a link to the pattern. It is a fairly straightforward method, and I hope you enjoy it! I look forward to when I make another pair for the second Ood doll. Before I start on that, though, I am going to make the jacket for this doll. I have been browsing the Sticka till Barbie website, and I found a few promising patterns. I will try my hand at one or two of them and go from there. Once that is done, it is just a matter of making shoes, gloves, and a brain for this Ood to be complete. It seems like a lot more when I write it down. Wow. I think she is looking better every day! For me, the biggest difference came when I cut her hair so that the mask would fit better. All she needs is a proper Ood shirt and the whole look will really pull together. Keep an eye out! Next week I will talk about some of the stuff that we found in my mom’s attic. We also just found a box in the basement with some gems, but they may be ruined. Some items were in a plastic box in the basement, and the basement flooded when the water heater broke. The box is covered in mud, but everything inside is relatively clean. The items are dry and not moldy, but they smell terrible. I am going to let them sit out for a week and then I will clean them. From there, I’ll decide if they’re worth keeping or if I have to let go of a fascinating flash from my past. I’m sure I will write about it either way, so we have that going for us. Anyways…. I adore you all and hope you have a fantastic week. I can’t wait to see the finished Ood! You are doing an amazing job.